The title of this post is the same as that of this article in the Warrington Guardian. Delays caused by signalling faults could eventually be a thing of the past on trains running to and from Crewe. 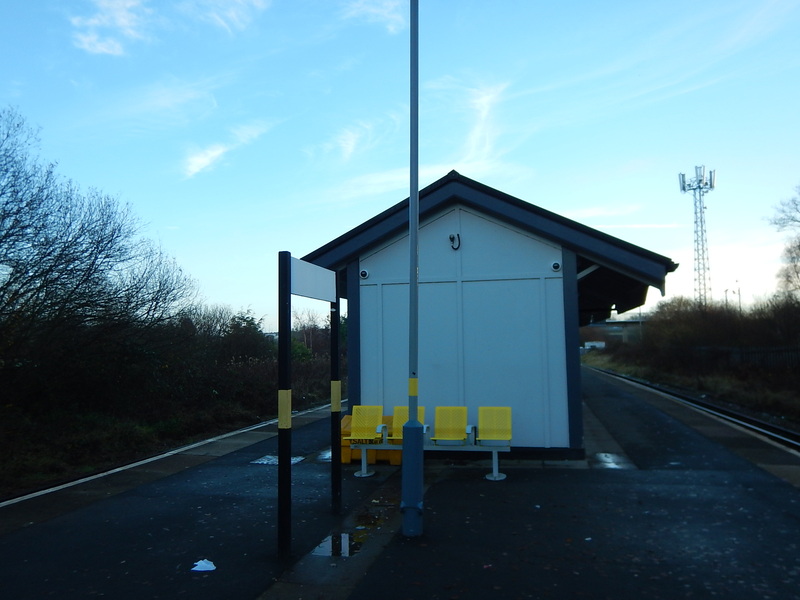 At a meeting on Friday Pete Waterman, chairman of the Cheshire and Warrington Local Transport Body (LTB), revealed that Network Rail, the Department for Transport and HS2 Ltd have agreed that the town will become home to Britain’s first all-digital station. 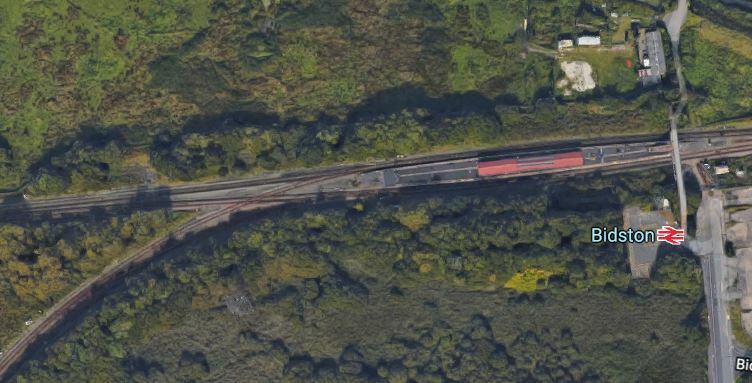 It means that all trains running from Crewe to Warrington, Chester and other destinations across Cheshire would benefit from the same technology which will be used by HS2 services – meaning lines could run more efficiently with trains travelling in a tighter sequence. I feel that increasingly, digital signalling will be used to improve capacity on UK railways. I was given a write-up in the Ipswich Town program today and some people who visit, may have been directed from the program. Don’t take anything I say too seriously, as underneath it all I try to amuse and inform. Remember too, I have other interests outside Ipswich Town, like art, architecture, engineering and trains. I also feel that one of the ways we’re going to get this country out of the mess it’s in, is by appreciating what we’ve got here in these Isles and enjoying it. Who would have thought that a visit to Middlesbrough or Crewe could be so enjoyable. But they genuinely were and I shall be visiting other places in the next few months, that might be equally unpromising. Hopefully, they’ll be equally enjoyable, even if Town don’t win or the trip has nothing to do with football. The next trips will be Portsmouth and Scunthorpe. Feel free to post comments. I reserve the right to remove those that are not constructive! It was a good trip, not only because Ipswich won and I was able to renew old memories in Chester, but also because of the little things that happened and that I discovered. Virgin’s First Class lounges made travel in my condition a bit easier. The Crewe Arms offered a comfortable bed and good coffee in the morning close to the station and the football. 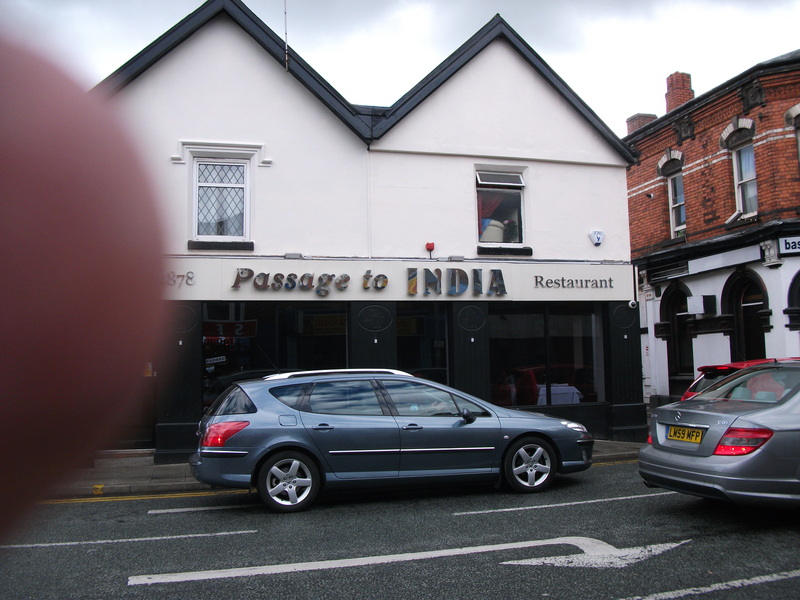 I had a very good curry in Passage to India in Crewe. The staff and stewards at Crewe Alexandra were pleasant and welcoming. Real pubs still exist in the most unlikely places. I got a nice complimentary gluten-free salad on the way back. So Virgin can do gluten-free, despite what I said earlier. I shall definitely go to Crewe again, if Ipswich play there! After a good night’s sleep and some nice coffee in the Crewe Arms hotel, I took a short walk to the station and bought a return ticket to Chester, which would get me back in time for my 15:57 train back to London. I actually could have boarded my return train at Chester, as it had come from Holyhead, but I wan’t too sure of my plans in Chester. And I was a bit wary of missing the train home! One of the few places that are worth seeing in Crewe is the Crewe Heritage Centre, which is a railway museum. Unfortunately it was closed, despite it being the school holidays. 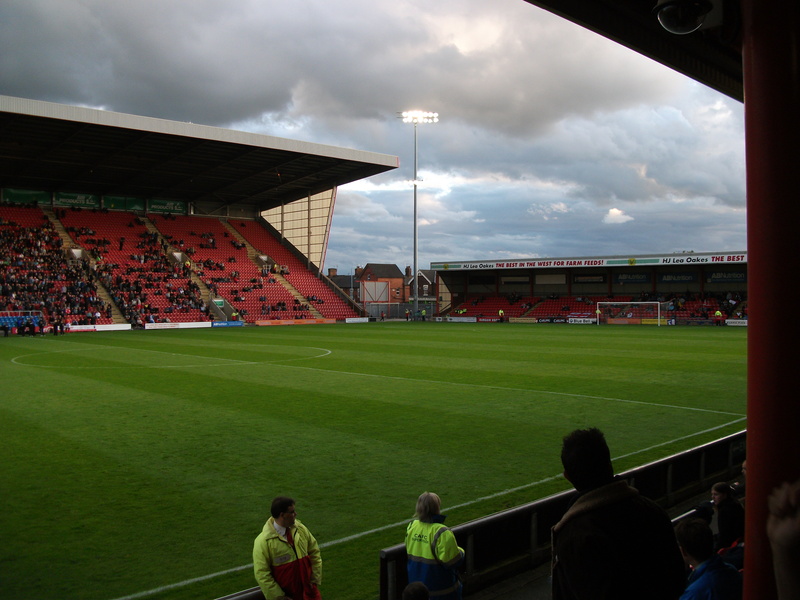 But as it is within walking distance of the station and the football ground, it would be an ideal place to waste a few hours before an away match with Crewe Alexandra. I really enjoyed the game at Crewe last night. I know Ipswich won, but the football was good and it could easily have gone to penalties. I should also say, that Crewe’s stewards knew how to make visiting fans appear welcome. Something that some clubs could learn how to do! I also had a problem in that I needed to take my medicine. That was no problem, as I asked one of the helpful staff in the refreshment hut, if I could have a glass of water. I got it without question. That was typical of the attitude on the club. I noticed that some of the buservices in Crewe are run by a company call D & G Bus. Obviously as Crewe is in Cheshire, these buses must be the first choice of the many footballers wives who live in the area. After reading the Wikipedia entry for Crewe, I was apprehensive, as it is not complimentary and quotes Bill Bryson as saying it isw the armpit of Cheshire. But I also have had the other view from the late MP for Crewe; Gwyneth Dunwoody, who used to be my next door neighbour. She was the sort, that if you went to borrow some sugar, you didn’t return until after several stiff drinks. Even last week at Crystal Palace, a fellow Ipswich fan had said that he’d enjoyed a couple of trips to the town to see Ipswich. 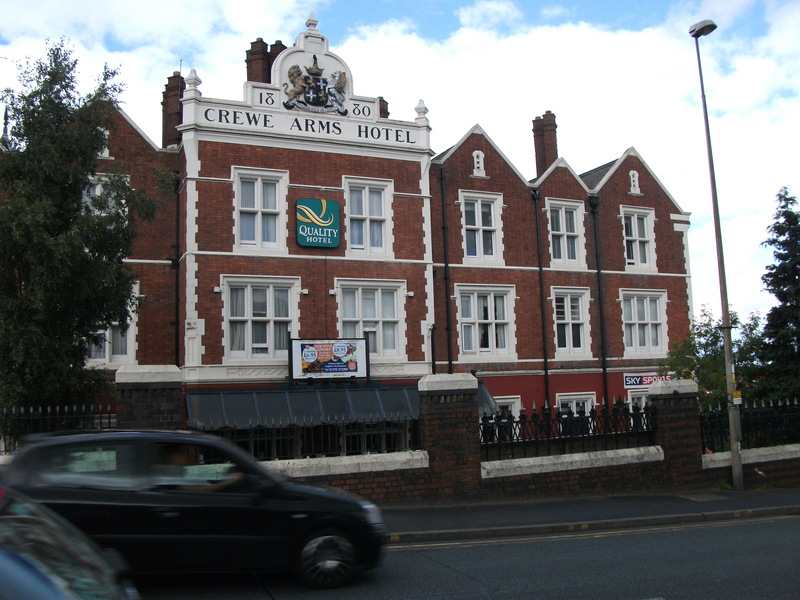 I stayed in the Crewe Arms by the station, which is typical of many station hotels all over the UK. It has mahogany panelling, deep red carpets and brown leather sofas. One unexpected thing it has is free and high-speed wi-fi. It definitely didn’t have that in 1880 when it opened. I slept reasonably well too, as the bed was comfortable. The room was very clean with a bathroom that looks like it had been refurbished in the last year or so. In the morning, I skipped breakfast because I ate well the previous night, but the coffee I had in a proper china pot was of a high standard. I would certainly stay there again, if I went back to the football at Crewe. 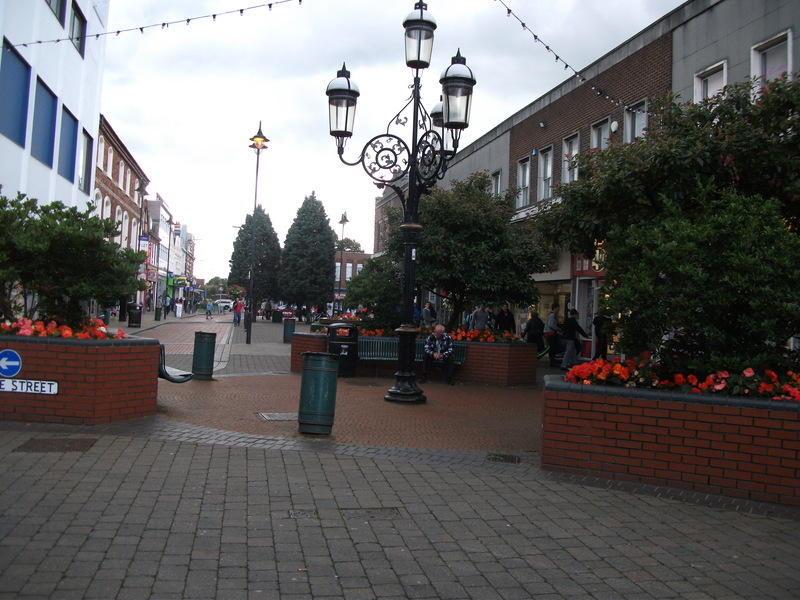 The town centre was fairly clean with a lot of flowers and had most of the usual names. But the highglight last night was an excellent Indian meal in the Passage to India. The building was best desribed as clean, smart and comfortable, the staff were polite and professional and I give the food at least five bricks in honour of Brick Lane, where C and I had one of our most memorable Indian meals together. 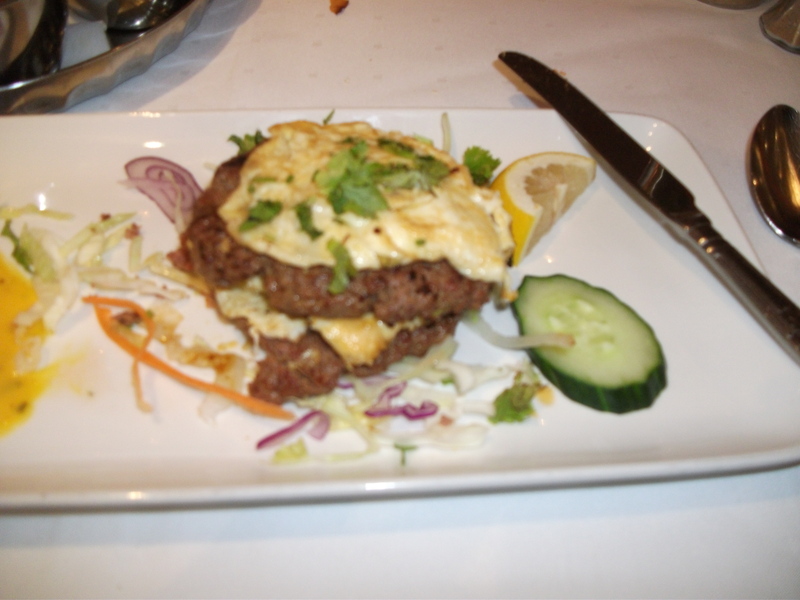 How about this for a seious shami kebab.